212 pages | 18 B/W Illus. Resilience is currently infusing policy debates and public discourses, widely promoted as a normative goal in fields as diverse as the economy, national security, personal development and well-being. Resilience thinking provides a framework for understanding dynamics of complex, inter-connected social, ecological and economic systems. The book critically analyzes the multiple meanings and applications of resilience ideas in contemporary society and to suggests where, how and why resilience might cause us to re-think global change and development, and how this new approach might be operationalized. The book shows how current policy discourses on resilience promote business-as-usual rather than radical responses to change. But it argues that resilience can help understand and respond to the challenges of the contemporary age. These challenges are characterized by high uncertainty; globalized and interconnected systems; increasing disparities and limited choices. Resilience thinking can overturn orthodox approaches to international development dominated by modernization, aid dependency and a focus on economic growth and to global environmental change – characterized by technocratic approaches, market environmentalism and commoditization of ecosystem services. Resilience, Development and Global Change presents a sophisticated, theoretically informed synthesis of resilience thinking across disciplines. It applies resilience ideas specifically to international development and relates resilience to core theories in development and shows how a radical, resilience-based approach to development might transform responses to climate change, to the dilemmas of managing forests and ecosystems, and to rural and urban poverty in the developing world. The book provides fresh perspectives for scholars of international development, environmental studies and geography and add new dimensions for those studying broader fields of ecology and society. It was rewarding to read a book that discusses and illustrates resilience from so many perspectives. 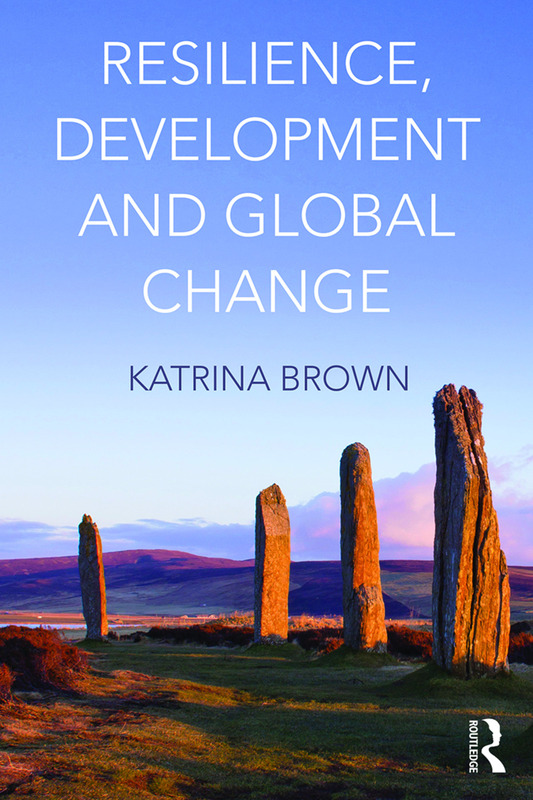 Researchers, students, policymakers and practitioners concerned with global change will appreciate Katrina Brown's re-visioning of resilience as an opportunity to collectively negotiate and influence current and future sustainabilities. This book provides an examination of the rise of resilience as a cross-disciplinary concept and framework within global development. The political ecology approach taken through the book provides a critical examination that links with contemporary debates in policy and practice around poverty and climate change. Populated with illuminating case studies, this is essential reading for anyone interested in truly sustainable development goals. With its bountiful exhibits of 18 figures, 28 tables, 18 text boxes, a useful glossary and hundreds of up to date and relevant references, this book is a crucial resource for lecturers and new resilience scholars… Books such as Resilience, Development and Global Change add value to knowledge in ways that tweets, brief journal papers and rambling websites will never be able to do. Just read it. Katrina Brown is Professor of Social Sciences at the Environment and Sustainability Institute at the University of Exeter, based in Cornwall in the UK. She has a strong commitment to interdisciplinary analysis of, and innovative approaches to, environmental change and international development.